Introducing solid food: let the adventure begin! Purée? Whole food? Organic? Family meals? Infant cereal? 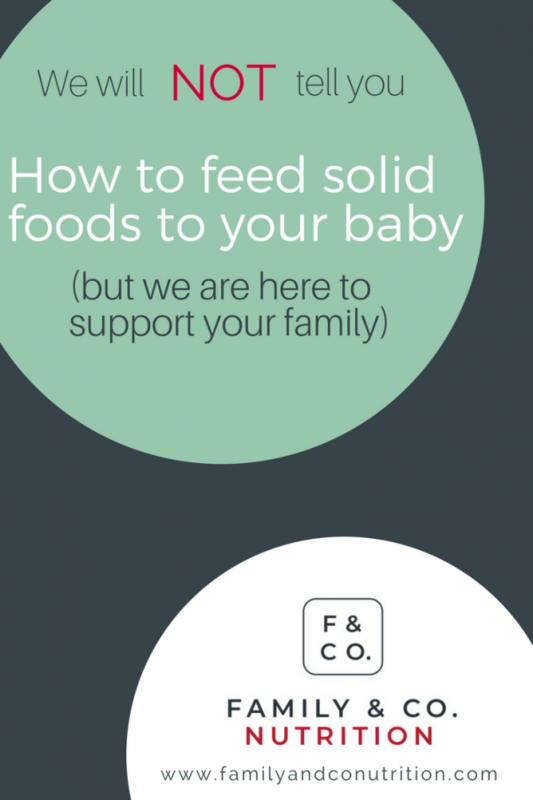 …What on earth are they supposed to eat when introducing solid food? Between what Google, your mom, Instagram and your best friend have suggested, no wonder you’re left unsure about what’s the most appropriate for your family and your child. 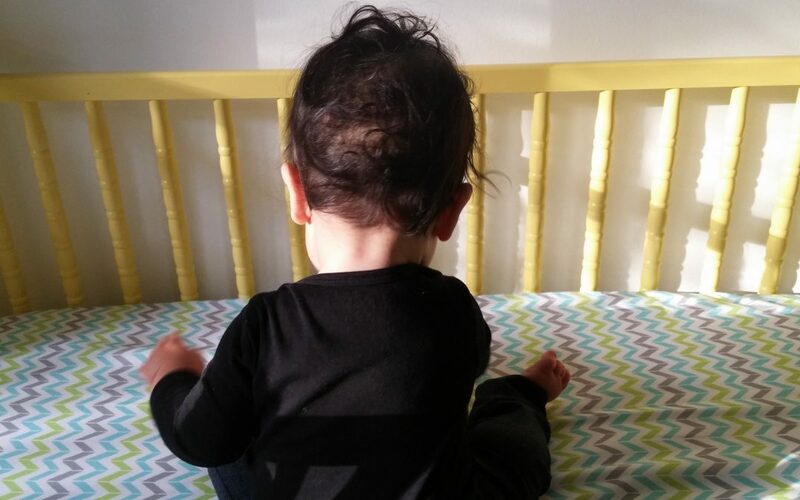 Starting with solids: what are you supposed to do? We get it – it’s confusing. We barely make sense of what to eat as adults, and we certainly want the best for our little ones. There are feedings trends…there are new research studies published… but it all comes down to one thing: your parenting style. Although milk (breastmilk or formula) will continue to provide most of the calories and nutrients that baby needs in the first year, it is important to introduce solid food around 6 months of age because baby probably shows interest, and is developmentally ready to get eating. 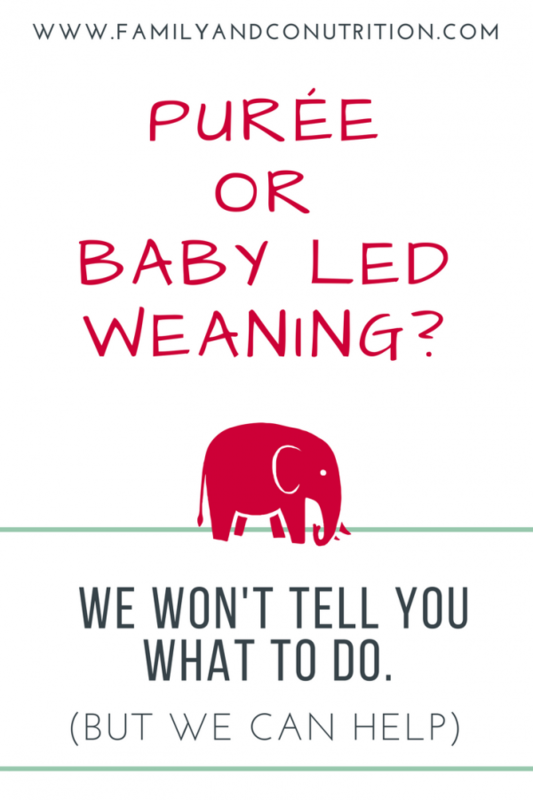 Should I do baby-led weaning? You’ve heard of the new Baby-led weaning approach. You provide appropriate food: you are in charge of the WHAT, WHERE, WHEN, and HOW. Your baby decides IF and HOW MUCH food to eat. You’re the brain, they’re the guts. Match made in heaven? Yes, and it would also be true with the traditional way of offering purées. You don’t have to choose one or the other. There are advantages and disadvantages to both methods. You might have heard good and bad things from both methods. What is most important is that the method you choose feels right for you, baby and the whole family. A non-stressed parent is always key in establishing a positive feeding environment and that is more important than the method you choose. Solids food introduction: What is recommended? Start with iron-rich foods like meats, meat alternatives and iron-fortified baby cereals. Progress in textures, forms and shapes. 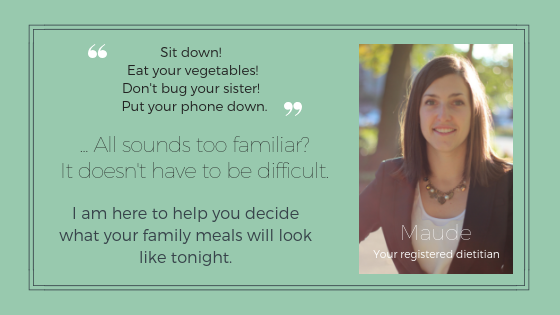 The goal is to offer family meals and snacks around 1 year of age following your family eating schedule. This will depend on your child’s developmental milestones and might not happen at exactly 1 year of age. Offer foods cooked with limited salt and sugar. Ensure food is prepared, served and stored safely. Encourage self-feeding with finger foods, where baby leads the way under your constant supervision. This responsive feeding ensures you respect baby’s hunger and satiety. Don’t delay introduction of allergens. Offer breastmilk up to 2 years of age or as long as you and baby feel so. Offer a daily supplement of vitamin D.
Ultimately, we want to “encourage parents and caregivers to be role models and instil lifelong healthy eating habits” starting with the introduction of solid food. When we keep in mind that the whole idea behind introducing solid food is to TEACH babies how to adopt a healthy diet, the HOW suddenly has less importance. Whether you offer purées or soft finger foods first will depend on your parenting style. Babies will end up at the same place: eventually eating whole foods, taking part in family meals, developing a healthy relationship to food, and respecting their appetite. 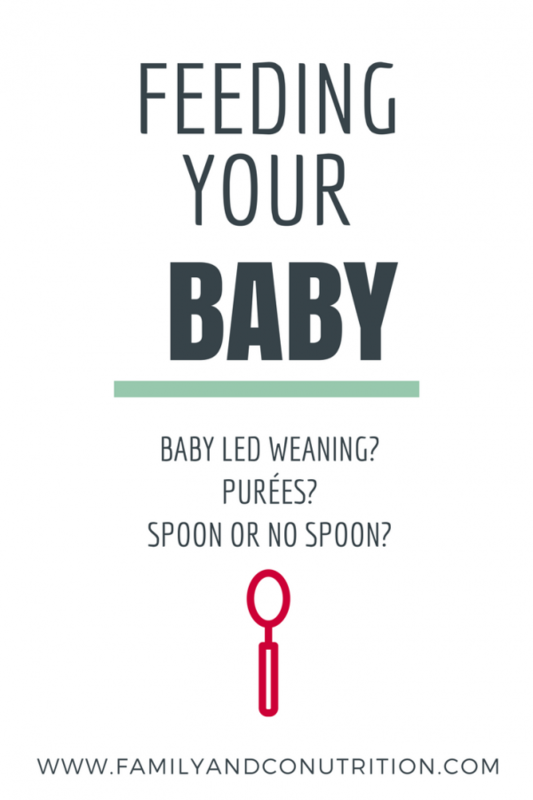 There is no right or wrong way of feeding your baby as long as you do it safely. Meal time: What’s your family style? What is your relationship with food? And your relationship with your body? How involved is your partner? What is the family dynamic like? Where do you typically eat dinner? Do you (and who?) prep family meals? Older siblings? Who sits at the family table most nights? … you get it. As many answers as there are eaters. That is why you will adopt an approach that ultimately will be unique to your family. We wish all new parents would feel confident when starting solids food with their babies. We don’t care which method you go with. We encourage you to offer nourishing foods and to enjoy the moment. Trying to convince you of the best method to adopt is rather futile. What do we have to gain? We are not preaching here… we want to empower you and give you and your partner the skills, knowledge and confidence to make choices when it comes time to feed your family. We rather help you define what works best for you in a way that is sustainable for the whole family and over the long haul. How do I know what is best for me and baby? If you are more nervous, using a good old spoon and serving purée might just be the perfect approach to feeding your child in a relaxed atmosphere where everyone enjoys their meal. Maybe it makes more sense to you to simply offer soft finger foods and let your child make a mess as they explore. It doesn’t matter…. it really doesn’t. As dietitian and nutritionist, we are here to support you in the method of your choice. Not to judge you. Not to convince you. We are here to help you do it right for your family. We are here to guide you as you determine how to introduce solid food, and what your family meals will look like. Food before 1: just for fun? Contrary to popular belief, food before 1 is not just for fun! Food and the act of eating as a family have several purposes. Food before 1 is much more than just for fun! Brown A, Jones SW, Rowan H. Baby-Led Weaning: The Evidence to Date. Curr Nutr Rep [Internet]. Current Nutrition Reports; 2017;6(2):148–56.